If you’re headed outdoors for any length of time, it goes without saying that good quality camping knives are a must-have component for your toolbox. But just what qualifies a knife to become a camping knife? Despite the overlap in the different outdoor knife categories, the camping knife is generally described as a heavy-duty knife. Exhibiting a blade under 5” in length, typically full tang, it can be used for cutting rope and cord, splitting kindling, whittling tent stakes, assisting with food preparation, clearing brush (in case it is necessary) and chopping firewood. Just as it was for those intrepid explorers, Clark and Lewis, the quality of your gear remains the greatest definer of your camping experience. Regardless of whether you choose to camp by the roadside with your tent pitched next to the car or if you’re headed several miles into the woods for a lengthy hike. 2 How to Choose the Best Camping Knife? 6 What About Multiple Knives? A camping knife will be used to carve wooden stakes, cut rope, clear brush, and help with food preparation. You might also have to carry it long distances so besides being strong and versatile enough to handle a diversity of tasks, the knife should be compact for easy transportation. Let’s dig deep into each one of these knives. This awesome outdoor knife from Buck has an extremely sharp 4 5/8-inch-long drop point blade made of 420HC steel. That means it is corrosion resistant, strong, and retains its edge well. The handle is manufactured from Micarta and features steel bolster to give you a safe, non-slip grip. The beauty of the bolster is that it works as a makeshift hammer when camping. The grip has an integrated fire striker and whistle which is good for emergency situations. The knife comes with a molded nylon sheath that can be carried on the belt. It also comes with a lifetime warranty, as do all Buck knives. These outdoor camping knives can be used for a multitude of tasks, including hunting. It’s strong with a 4.5-inch fixed blade, made of 440A stainless steel. The handle has a glass filled nylon core for extra strength. The knife’s overall length is 9.4 inches and it weighs 6.3 ounces. Included with your purchase is a nylon sheath with a protective lining. This knife from Red Deer is versatile and some would even use it for hunting. It’s perfect for those chores around the campsite too. The knife has an overall length of 9 inches, and the handle is 4.5 inches long. The blade is sharp and holds its edge well. The comfortable handle is made with attractive multi-color pakkawood. A brown leather sheath comes included. This is a well-balanced knife with a good finish on the blade. The blade is 7Cr17MoV stainless steel, so it won’t corrode and will hold a good edge. It’s fairly large, with a 9 inches overall length and a blade length of 4 inches. It is built to handle even the chopping of small wood. The handle has a long grip with finger grooves for comfort. The Browning Bushcraft comes with a good quality leather sheath. Cutco offers these exceptional quality camping knives with an extremely sharp blade. It is available with a choice of two different edges – either straight or Double-D. The blade is 5-3/8 inches long, and the overall length of the knife is 10-3/8 inches. The knife has a sturdy, non-slip and highly engineered thermo-resin handle in a choice of two colors. It comes with a leather sheath and lanyard. This versatile knife weighs in at 4.2 ounces. This is a smaller knife than the previous one and is basically a pocket knife. It’s great for doing all those small jobs around the campsite like cutting rope and slicing jerky. It is spring assisted and measures 3.5 inches long when closed. The stainless-steel blade is extremely sharp and is 3mm thick. The knife has an attractive stainless-steel handle with an acrylic insert. This versatile, larger-sized camping knife has a 10-inch carbon tool steel blade. This knife will get the job done around camp however tough it is, whether it’s clearing bushes and vines or cutting up meat. Kershaw’s camp knife features a full tang handle made of rubber with a safety guard to protect your hand. The knife comes with a molded sheath with nylon straps that make it easy to carry. Benchmade has manufactured a great all-purpose outdoor knife that we’re sure you’ll love. The blade is CPM-S30V stainless steel and holds its edge well. It’s a full-tang fixed blade that’s easily cleaned because of its simplicity. The G-10 handles come in a choice of green or red. They’re moisture proof and comfortable to hold. The Bushcrafter comes with a leather sheath with a belt loop for your convenience. This durable knife is an ideal all-purpose knife whether you’re at home or enjoying the outdoors. Take it along with you wherever you go, and you’ll find a hundred uses for it. It’s just over 7.7 inches long, but when closed it’s about 4.5 inches. The strong, narrow blade is 8Cr13MoV stainless steel. If you’re a fan of folding knives, I strongly recommend this one. Once the blade is locked it’s very stable with no play. The G-10 handle is sturdy, non-slip and comfortable. Whether you’re needing to cut ropes in camp or cut up the food by the campfire, Case has the knife for the job. This one has two blades, both full-length. One is a multipurpose Clip blade and the other a utility Spey blade, and both are manufactured from Case Tru-Sharp Stainless Steel. The handle is Case’s special Kirinite material which is comfortably smooth but does not slip. This model is red, white and blue, hence the name, “Patriotic”. It’s 4.13 inches long when closed and weighs just 4 ounces. How to Choose the Best Camping Knife? When deciding on which are the best camping knives and tools, you are the only person who has any idea of what you really want and need. Different people aspire to different things in their knives, which can lead to a discussion that often threatens to be a never-ending one. One of the best ways of deciding what is essential for camping knives is to imagine that it’s the only tool you can have in your toolbox. This means it should be a tool that can do everything you need to be done when you’re camping. So, in a nutshell, you need a multipurpose blade that can help you survive in the great outdoors. By definition, camping involves a lot of activities in the great outdoors, including fishing, hunting, and basic survival. Other tasks like food preparation, cutting the cord, chopping firewood, and sometimes even self-defense, all mean that a single knife cannot complete every task, but it can be a big help in accomplishing most of them. As we imagined earlier, you only have one knife in your toolbox. It needs to be long enough to complete a variety of tasks around the campfire, but it also has to be easy to handle for more delicate activities such as carving wood or skinning game. While pocket knives are comfortable to carry around and are capable of small jobs, they are generally too short to enable you to do much. As a result, they are disqualified from my list, which some might consider a little unfair as they are great if you need something as specialized as a screwdriver. Huge, Rambo-style knives are also off my list as they are far too large and bulky to handle with ease, which is an important aspect when looking for that perfect knife. They are also heavy to carry around and can slow you down when you’re backpacking. Plus, they are not easy to conceal and believe us, you do not want to be the weird guy carrying around that massive knife in a public camping site. In summary, the knife you need in your camping toolbox should be no more than six inches, but no less than four inches long. Think of a knife like the Buck Vanguard, for example. It’s darn near perfect for meeting most requirements, and because it’s from Buck, it has a lifetime warranty, which is an important factor when you consider that any outdoor blade will be prone to wearing out over time. An excellent camping knife needs to be strong. Imagine cutting a thick rope or defending yourself against some wild animal, a penknife just isn’t going to be up to the challenge. But it should also be flexible enough that it can handle dressing tasks such as deboning and filleting. Not all camping tasks are standard for all campers. Not everyone will be hunting. You need to think about which activities you expect to carry out frequently when in the outdoors. Do you like to do a lot of fishing? Then you need a blade that is good for cleaning fish and maybe filleting. If you are into hunting small animals, then a knife that can stab would be ideal. Just remember, it should still be able to handle a whole host of other tasks too. A lot of people argue about the fixed or folding aspect of a knife, but in reality, it’s not all that important when compared to the other characteristics we’ve discussed above. It’s these traits that warrant your attention if you are really looking for a quality, multipurpose blade. A fixed blade knife is better for more robust tasks, but it will need to be kept in a sheath and on your belt to save you from accidental damage. But, if you’re looking for a practical option that you carry everywhere and use often, a folding blade is probably best for you. For hanging at the campsite or just walking on the trail, a good folding blade will be adequate for the satisfactory execution of most little jobs. A fixed blade, however, displays superior qualities of strength, cleanliness, and safety. Fixed blades won’t close on your fingers. Even folding knives with locking mechanisms have been known to fail and cause serious injury. Fixed blades exhibit no moving parts, which makes them a lot easier to keep clean. And with full tang models fashioned from a single piece of steel, fixed blade camping knives are stronger than the best folding camping knives and therefore better suited to the more demanding tasks around the campfire. The only type of knife that you should have in your toolbox is a sharp one. A blunt knife is not only useless, but it is also dangerous. Always keep your blades sharp, whether you are using them on a daily basis or not. Another highly debatable factor is the hardness of the blade. You have two options; a soft, easy to sharpen knife that takes an edge fast but doesn’t hold it for long or a blade of harder material that is quite difficult to sharpen, but retains the edge for much longer. The angle of the blade is also critical. A good camping knife is created in such a way that each side of the edge is beveled. This means that the best angle is quoted as half of the complete angle, so you know how to hold to get the best results when sharpening. At an angle of more than ten degrees but less than 17, you get an edge that is suited to soft tasks such filleting a fish or cutting flesh. The angle would is suitable for cutting through hard materials, however, and the blade would need repeated honing. An edge of between 18 degrees and 25 is the most common for knives used in a domestic kitchen. 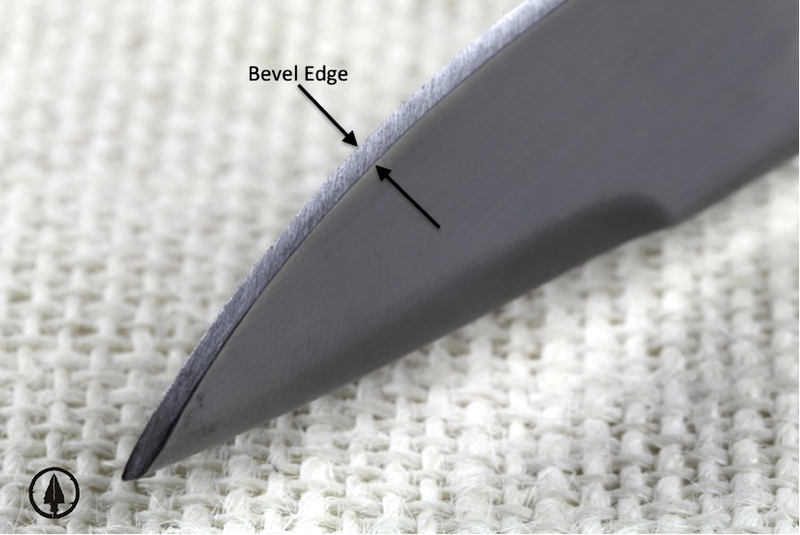 A 20-degree angle will produce a moderately sharp knife that will cut through various everyday materials well, while still holding the edge for quite a while. Care should be taken though, to ensure that the edge is evenly sharp along the entire blade. In my opinion, the best outdoor knife should have an edge of between 25 and 30 degrees. This is not too sharp, but the tasks that you will be handling around a campsite usually won’t require an extremely keen blade, anyway. Plus, the edge will keep for much longer, even when conditions are less than ideal. An angle of more than 30 degrees is best for axes, machetes, and hatchets. Using such tools requires some degree of force, which is not the same as how you use your camping knife. Once again, it all depends on the kind of tasks you intend to use the tool or knife for and the frequency of those tasks. This is one of the most used blades as it is multipurpose, and is suitable for a wide variety of different tasks. The clip point is a favorite in both fixed blade variants and folding knives, as they are ideal for many piercing tasks. Another popular option for multipurpose use. Most camping knives come with a drop point, as do a lot of folding, pocket, and fixed blade knives. This needle type tip can be either double or single-edged. It is often used as a throwing knife and can be used to hunt small animals if you have the skill for that kind of thing. This kind of knife usually comes with a firm tip for tackling more difficult tasks. This means it can be quite a challenge to sharpen correctly. The tanto is commonly found on folding and fixed tactical knives. Used a lot for skinning knives, the trailing point comes with a large, rounded belly. It’s also great for filleting tasks. With no tip at all, the sheep foot is used for trimming hooves, carving wood, and other similar tasks. Commonly used for gutting an animal since it is easy to control and when used correctly doesn’t damage the inner organs. The gut hook is a favorite tool of many serious hunters, but is notoriously difficult to sharpen properly. To learn more about blade shapes and hunting knife designs, read my full guide here. For outdoor excursions focused on roadside campgrounds, state parks, or camping at the beach during the summer weeks, then a standard camping knife will usually be sufficient. However, if you’re a dedicated fan of the extreme outdoors regularly finding yourself in remote places known only to the antelope and the deer, you’ll already know that the weather can turn bad at the drop of a hat. It’s not uncommon for a pleasant day in the woods to develop into a survival situation in under an hour. The informed outdoor enthusiast will carry more than one type of knife on their excursions. This ensures they are well equipped to tackle situations where a standard camping knife may be deemed insufficient, but a full-blown survival knife could be seen as inappropriate. Camping knives are crucial open terrain and woodland gear. They are just as important as the rain fly, stove, and hiking boots. Before setting out on the next outdoor adventure, make sure you take at least one high-quality camping knife along with you. Your choice of camping knife will depend largely on what your gut tells you about which knife is best for you. Once you’ve figured out what you will use the knife for, the decision will come along easy. Remember, there is no magic knife that will accomplish every single task. You will need different blades for different jobs. Think pocket knives, machetes, and an ax for chopping wood. All of these are valuable tools, and they play an important part in ensuring that you are well prepared for your next camping adventure. By joining my email list, You can learn some sharp, intelligent and amazing hunting methods.